How to Support Customers with Disabilities? If a caller cannot hear completely or partially, it can pose a challenge for the agent. In such scenarios certain technologies can be used to ease the situation such as TTY (Tele Typewriter) or TDD (Telecommunication Devices for the Deaf). These devices will help the customer with hearing problem type the questions and receive the answers in the same way. The customer can also be asked to contact customer service through online chat rooms. The written communications can eliminate the hearing disability. But the call center agents should know how to deal with such a call before communicating with the caller in the first place. For the callers with hearing problems, the agent needs to talk slowly, loudly and clearly. This would help the caller understand. Visual impairment does not always mean blindness. There are various degrees of visual impairments such as blindness, color blindness, etc. While a blind person cannot see anything at all, a color blind has problem in distinguishing the color and navigating through web pages. To support the customers with visual impairments the agents from call centers in India should have the skills of explaining processes and services to the customer over the telephone. The agents have to teach the customer thoroughly so that there is no gap between the written texts at the website and the words explained by the agent. The agent should also input required information where there is need, if the website does not contain speech to action converter. The customers with visual impairment cannot be sent to a website for further information; they need to be told everything by the agent. The agent here acts as the eyes of the caller. 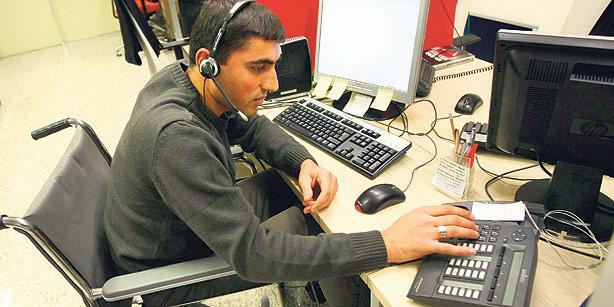 The call centre agents are also likely to encounter callers with learning disabilities. These disabilities may range from forgetfulness about certain actions to Dyslexia. To communicate effectively with this group of people the call centre agents should have the ability to answer and explain in a variety of ways. For example callers with problems in remembering may need to be prompted while writing down answers. The agents should not be bothered about the time. Though the agents are always taught to solve problems in least time, but this rule should be altered while dealing with callers with learning disability. The first step to helping such customers is diagnosing their barrier. Next, the agent has to find a way to get across to the caller in the simplest possible way. When offering services to the callers with disabilities the agents should possess an understanding soul and they should go to any extent to help the callers. It would also need confidence and a deep knowledge about the process for the agents.